Hollywood is associated with many things, from ultimate glamour to broken dreams, from material riches to moral poverty, red carpets, limos, elegant fashions, Hollywood and Vine, footprints in concrete, sunglasses, screenplays, and so on. The word Hollywood may bring to mind many things, but it's likely not one of them is holly. However, the name does have its origin in vegetative reality. According to legend, Hollywood is named after a native shrub growing in the area; Heteromeles arbutifolia, also known as California-holly. I suppose it is only fitting that with all of the props, facades, computer generations, silicone, and facelifts in Hollywood, the holly of Hollywood is not a true holly (Ilex genus). It is actually a member of the rose family. However, the red berries in winter and the toothed leaves do suggest holly. Seeing these plants with red berries in the Santa Monica Mountains or the San Marcos Pass makes me feel all Christmas-y inside and with childlike enthusiasm, I point them out to my husband. Apparently this plant has made alot of people feel Christmas-y, for in the 1920s, legislation had to be enacted to protect the plant and it was made illegal to collect branches on public lands. Presently, it is illegal to collect plant matter of any species on public parklands. This is neccessary in a state with a large human population. We can love our plants to death. 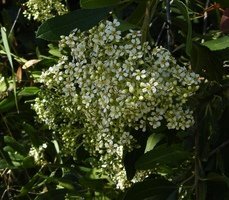 It appears that the most often used common name is toyon. That is the first name that I learned, so in the rest of this article I will refer to the plant as toyon. Some less common names include California Christmas berry and of course, hollywood. Toyon is a medium to large shrub, from 6 to 25 feet tall, though usually less than 15 feet tall. It is native to the non-desert mountains and foothills of California and adjacent Baja California. It can be found from sea level to 4000 feet elevation. 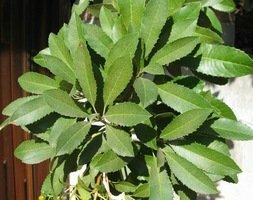 Typically it is a chaparral plant, but I have also seen it in live oak woodlands. It is evergreen. 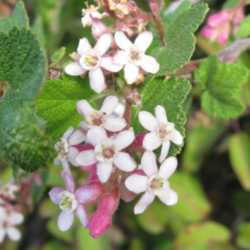 It blooms in late spring to mid summer, after most other California native plants are done blooming. The flowers are mildly fragrant, and to me smell just like I would expect clusters of tiny rose family flowers to smell - like spirea as I remember it. The berries ripen in November and December. 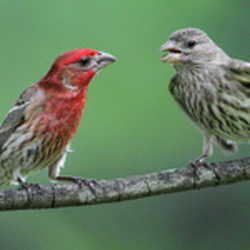 It is reported that birds are attracted to the berries, though I have not found that to be the case at my house. If the berries are not eaten, they will remain on the bush for months. Raw berries are poisonous to humans, though the Native Americans made them edible by cooking them and discarding the seeds. I have found toyon to be one of the easier California native shrubs to grow. It does not seem to be overly picky about soil. In the wild, I have seen it mainly in rocky soil, but it does just fine in my rock-free clay soil, too. 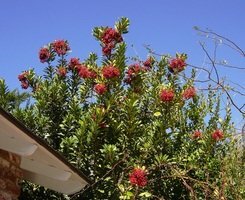 Most coastal California natives cannot tolerate summer water, but toyon can handle occasional water. It fits in well with xeriscape plants from other parts of the world that need a little summer water. My largest plants are immediately downhill from the neighbor's lawn, which of course they need to water regularly. I have also found that the bushes grow best where the tops are in the sun but the roots are shaded. The tops need sun in order to produce a good crop a berries and the berries of plants growing in the sun color up faster. Toyon is hardy to -10 F (USDA zone 8). Sunset  recommend growing the plant in any western climate except the deserts and the coldest mountains. Personally, I think they would be do-able in the milder high desert regions (Sunset zones 11 and 12 ) provided that the roots are shaded. Some parts of desert zone 10 may be be too cold, and desert zone 13 is probably too hot for too long in the summer. Toyon can be grown from seed. It is reported that fresh seed will germinate right away, but seed that is not fresh should be stratified for three months. Plants can be grown from tip cuttings taken in late summer. You may be able to find 1-gallon or 5-gallon plants at your local nursery, depending on your location. Independently owned nurseries seem more like to carry a better selection of native plants than the big chain stores. Also, if you live in California, you may find plants for sale at a plant sale sponsored by your local branch of the California Native Plant Society. 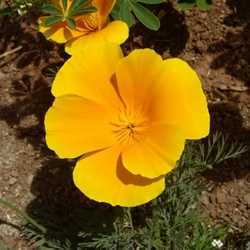 These sales are typically held in the fall since that is the best time to plant most California native plants. Check the society's web site or the garden calendar in your newspaper for more information. Now you know, there is a "holly" in Hollywood. It's my favorite Hollywood star. It may not be a star of the silver screen, but it is a star of the chaparral and can be a star in your xeriscape garden. The word toyon is a hispanicization of the Ohlone Indian word totcon. Sunset zones - Sunset divided the western U.S. into 24 climate zones that take in account summer heat, rainfal, and humidity, not just winter low temperature.